It can be confusing knowing which fire extinguisher to use on different types of fires - not all fires are the same and some extinguishers can make the fire worse! If you have time to really think about it, common sense will tell you which extinguisher to use. But in the heat of the moment, anyone can panic when they see a fire and grab any extinguisher or hose reel. General purpose environments such as small retail stores, offices, workshops, garages, homes, and vehicles require Dry Powder extinguishers; they’re great for most everyday situations. Carbon Dioxide extinguishers could also be used, but they are a bit more expensive. Electrical and computer fires require Carbon Dioxide extinguishers. Dry Powder extinguishers can also be used in emergencies, but do not use any liquid extinguishers on electrical fires. Kitchens, food trucks and fuel stations need to have Foam (or ‘AFFF’) extinguishers nearby. The foam smothers and cools the flaming liquid, oils or fats. Do not use dry powder as you’ll just spread the fire! Also great at smothering kitchen fires are Fire Blankets. Fire Blankets can also be used to wrap a person to smother a clothes fire. To avoid confusion, ensure your extinguishers are hung in easy to reach locations with the right signage above it so people are aware before using them. If you have a unique situation, or you need extinguishers for a place of gathering (either a community or work environment), we recommend you get a professional opinion to ensure you’re covered if something goes wrong. Read our blog on what training is required for building evacuation and fire safety, including the need to train building occupants to use firefighting equipment, such as extinguishers, hose reels and blankets. Every fire extinguisher should have this official yellow inspection tag. It shows the last annual inspection of this extinguisher was in August 2017 and it’s last 5-yearly pressure test was in 2014. The actual fire extinguisher cylinders can last between 20-30 years, but they can begin to lose pressure within 5-years. 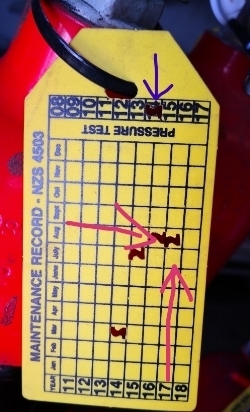 This is why extinguishers should be inspected each year by a certified inspector to check the gauge, the weight, and clip the official yellow inspection tag - as shown in this photo. Every 5-years, fire extinguishers need to be pressure tested and recharged. This is done off-site using specialist cylinder testing facilities. They drain the cylinders, test the pressure of the empty cylinder, then recharge the cylinders with new product and reinstall it at your site. Depending on what type of extinguisher you have, and whether there is a pressure tester nearby, it might be cheaper for you to buy a brand new extinguisher. How can I dispose old fire extinguishers? Scrap metal recyclers: its most likely that all non-metal needs to be stripped off and some scrap metal recyclers only take them in large quantities so please check with them first. Some local council recycling centres also allow you to drop off empty gas cylinders for free. Your fire protection provider will also generally take your old extinguishers when they install a new replacement unit.